​​There are books full of different ways to categorize, screen, and evaluate a good investment, but instead of theories they are called strategies. For example, LBW would be considered a “value” investor because we implement a “value” investing strategy. There are many other strategies such as growth, passive, strategic allocation, dynamic allocation, market neutral, etc. – you get our point. One strategy that has become a hot topic in recent years is Sustainable, Responsible, and Impact investing (SRI). For this month’s blog, we would like to take a dive into what SRI is, how it is categorized, and our general thoughts on this type of strategy. This thought process seems to be new, but it has been around for ages. For example, during the biblical times Jewish law laid down directives about investing ethically. The Qur’an and Islamic teachings include guidelines for Hala or Shariah-compliant investing that focus on moral values and require investors avoid some types of investments and even interests. Furthermore, in 1758 the Religious Society of Friends (Quakers) in their Philadelphia Yearly Meeting prohibited members from participating in the slave trade. Fast-forward to today, and as of year-end 2015, more than one out of every five dollars under professional management in the United States was invested according to SRI strategies. SRI can be defined as “an investment discipline that considers environmental, social and corporate governance (ESG) criteria to generate long-term competitive financial returns and positive societal impact.” Said differently, when an investor is looking for investment opportunities they want to make a dollar and some form of social return. Traditionally speaking, when investors are looking for opportunities they typically look to generate the highest return with the least amount of risk. To do so, they evaluate an investment’s fundamental characteristics such as its business model, financial health, and corporate governance. Economist Milton Freidman’s article titled “The Social Responsibility of Business is to Increase Profits” sums up this thought quite nicely – social responsibility typically isn’t in the cards. Instead, SRI attempts to find opportunities which exude potential financial gain and have the possibility of positive societal impact. SRI investing has many names depending on the type of strategy and criteria an investor uses. For example, if a fund is more driven towards environmental issues and impact, their strategy may be coined “green investing”. Or, if a fund is geared more towards companies that provide equal pay and have strong governance around these issues, their strategy may be called “ethical investing”. If you boil all of this down, two fundamental strategies emerge: 1) ESG incorporation into the investing process; and 2) filing shareholder resolutions and practicing other forms of shareholder engagement. As stated above, ESG stands for “environmental, social, and corporate governance”. Meaning, to implement an SRI strategy you must be using criteria that is represented in one of these segments. Below is a graph representing the potential sub categories for each segment. As one can see, there are multiple subcategories under each segment. An investor can use one segment or all three when looking for investment opportunities. 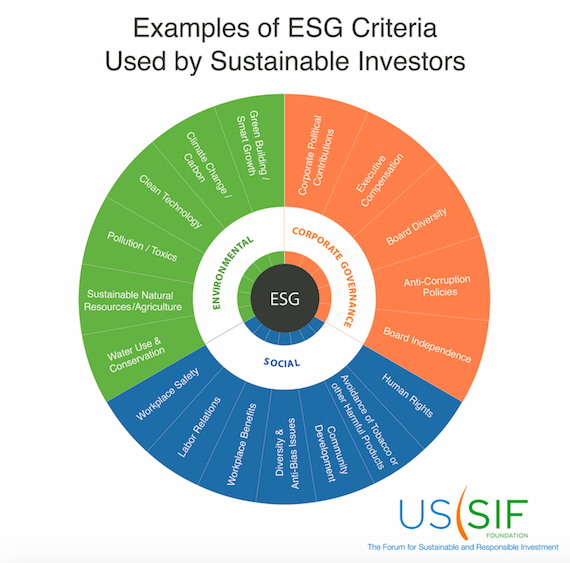 Typically, a fund will use all three segments and then come up with their own filtering mechanism to score its ESG components. The second SRI strategy is more active then just finding good social companies. This type of strategy attempts to help guide a company towards more sustainable and socially-responsible governance, through what is called a shareholder resolution. Shareholder resolution can be defined as “a formal resolution by shareholders ratifying or requesting a specified action by a corporate board.” Shareholders have the right to put together a resolution pertaining to company policy and procedures, corporate governance, or issues of social or environmental concerns. It is an avenue for shareholders to influence and promote socially-responsible policies within the companies they invest. SRI investing is a wonderful concept: generate more dollars for me all while making a positive impact on society – this is the epitome of a win-win scenario. However, if we break this win-win scenario into two parts we get the following: 1) make money; and 2) make a positive impact on society. Part one is universal as everyone wants to make money (legally of course). What becomes more of a grey area is part two, the opportunity that is making you money must be making a positive societal impact. The difficulty: everyone has a different opinion on how to define “positive societal impact”. For example, earlier this year Barron’s magazine ranked the top 100 most sustainable companies domiciled in the U.S and coming in at number nine was Clorox (CLX). Yes, the company whose main product is bleach was in the top ten of the most sustainable companies. Now, each company was scored on five different categories: shareholders, employees, customers, planet, and community and CLX scored well in each category, but does their impact in these categories outweigh the use of bleach and its potential negative effects? Furthermore, one large ask from investors is to exclude companies which produce goods such as tobacco, alcohol, or distribute and/or manufacture firearms. This makes sense as these products can produce harm to the consumer and potentially to the public (this effect is called a negative externality). Meaning, companies who produce this type of product would not be allowed in a portfolio strictly due to the product they produce, even if they are providing positive impact in other areas. As an example of a company producing such products who provide positive impacts elsewhere, Anheuser-Busch InBev NV (BUD) recently announced they will be labeling their product with a picture of a battery and the phrase “100%” to let their consumers to know the beer they are drinking was produced 100% by renewable energy. In addition, over the last 30 years BUD has donated 79 million cans or 7.3 million gallons of water to victims affected by natural disasters. Should we eliminate BUD just because they produce a product which people elect to drink? Furthermore, pundits have begun to express that companies with high ESG scores perform better than those who don’t. One could make the argument, that companies who are polluting, have poor employee relations, and act negatively will be hit with fines, penalties, etc. that will thereby affect their overall performance. Now, is this due to having ESG at the top of mind or is this just good business management? The world as we know it is a complex system of things. So much so, that the sole focus of some of the smartest brains around the globe is to discover and/or describe the world in a way that can be quantified and then measured. The investment management industry is ripe for these brains as the amount of data and subjectivity is vast. SRI is a perfect example of practitioners attempting to quantify and describe a complex idea for the masses. The issue, as seen above, is SRI has become a way to generalize “positive societal impact”, which in our opinion should be individualized. These examples are not meant to sway someone’s opinion one way or another, it is to evoke a thoughtful discussion on how to define what “positive societal impact” means and the difficulty in trying to satisfy everyone’s individualistic needs. SRI investing is a true win-win scenario and the goal of this blog was not to argue its merits. The goal is to shed light on just another investing “strategy” that seems to have lost its way in the competitive sales environment in which LBW resides. We like to call it a framework, rather than a strategy. In addition, we don’t like to fit into boxes, so we tell people who meet with us that we are not value investors, we are just investors. We want to find the best return for the least amount of risk.